On the surface of things, a water bottle seems like a pretty straightforward purchase right? After all its function is to do just the one task, contain and transport water so that you have a portable supply whenever and wherever you might be. However, we all have our personal preferences and CamelBak completely understand that which is why have designed a comprehensive range of bottles from vacuum insulated styles to glass water bottles, stainless steel bottles, plastic version, and even collapsible sports style ones. They all have their various pros and cons. One type might be lightweight and safe for the environment, another might feature innovative cap stowage for making protein shakes, another might sustain the temperature of your beverage for hours at a time. So let’s take a look at what we think are the Best CamelBak Bottles across their versatile categories that will quench your thirst while and keep you looking stylish too. The perfect water bottle for everyday and outdoor activities, the first product making it onto our Best CamelBak Bottle is their Eddy 1 liter. Available in a wide choice of clear and vibrant colors, it delivers spill-proof sipping results every time thanks to that redesigned cap and bite valve. Whether you are out on a trail or at your office desk, this insulated water bottle is an excellent solution to keeping yourself hydrated on the go. It’s made from 100% free BPA, BPS and BPF polypropylene while the valve is made from medical grade silicone. It’s part of their Daily Hydration collection and weighs 170g, measuring 8.9 x 8.9 x 25.4 cm. 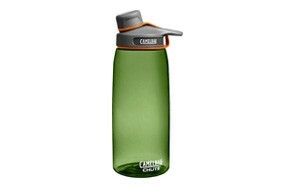 For more great options like this, check out our guide to the best filtered water bottles. Our next recommendation from CamelBak is their Podium Big Chill bottle which is perfect for bike and sports enthusiasts. Again, it features entirely BPA, BPS and BPF free polypropylene construction in a wide range of contemporary color choices. It features a double-walled, insulated construction which keeps cold drinks cold and hot drinks hot for many hours after you’ve set out pedaling. It weighs 148 g and measures 8 x8 x 27 cm and once again has a medical grade, self-sealing silicone valve with a guaranteed leak-proof closure. It features an easy squeeze and light-weight ergonomic design which is great for when you are focused on the road ahead and need to quench your thirst quickly. Perfect to always keep in your CamelBak backpack. 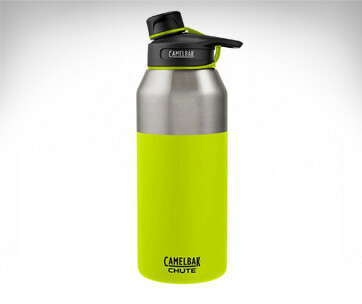 For immediate hydration no matter what the adventure, the generous 1-liter Chute Water Bottle from CamelBak is a great choice to have in your travel backpack wherever you go. With its wide angled spout and durable, leakproof design, it administers the perfect flow of water without any sloshing or messy spilling. From their Daily Hydration collection, it’s perfect to accompany you on everyday and outdoor activities ensuring you are adequately hydrated on the go. Made from Eastman Tritan, it’s dishwasher safe and BPA free and comes in a range of clear, vibrant colors. It weighs 172 g and measures 10 x 8.89 x 35.4 cm. Next to be featured on our Best CamelBak Bottles roundup is their best-selling stainless steel Eddy with its double-walled vacuum insulation that will keep cold drinks cold for an impressive 24 hours. 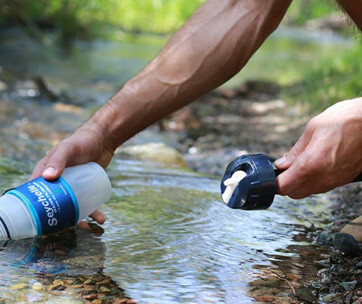 You can quickly and easily flip up the bite valve with a flick of the thumb making it easy to drink one-handed while you are actively out and about. Part of their Daily Hydration range it features a spill-proof closure and their trademarked CamelBak Big Bite Valve which is made from medical grade silicone. Eddy Vacuum weights 312 g and measures 7.6 x 7 x 23.4 cm. For more great items like this, check out our guide to the best hydration packs. For those of you who prefer to drink from a clear glass bottle then the CamelBak Eddy .7 liter is the smart choice for you. It’s made from BPA and lead-free glass and features an attractive protective silicone over the sleeve. Eddy Glass Water Bottle won’t retain odors or tastes so you can always be guaranteed of clean and clear hydration on the go. You can also sip without tipping thanks again to that patented flip-top bite technology. Available in a range of colored silicone sleeves it’s also dishwasher safe. It’s a glass bottle from their Daily Hydration collection that makes an excellent gift for travelers. It weighs 521 g, measuring 8.3 x 8.3 x 26.6 cm. 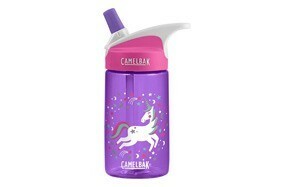 Our next CamelBak Bottle is a great gift for cyclists out there. Podium Dirt Series has very much been designed and engineered with your specific needs in mind and has an innovative integrated mud cap that keeps the dirt out of your bottle no matter what rough and muddy adventure you are taking it out on. With an ergonomic squeeze bottle design, rehydration on the go couldn’t be simpler. 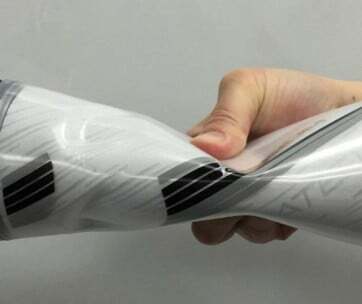 Of course, it’s from their Sport and Bike collection and is an insulated and leak-proof water bottle. It’s lightweight at just 91 g and measures 7 x 7 x 22 cm. Making sure that your kids stay hydrated is no easy task, and especially when they are in between ages, too old for a sippy but still too young to hold a full sized adult water bottle, then they need something like the CamelBak Eddy Kids Water Bottle. Just imagine how grown up they till feel with their insulated design water bottle. The colorful double-walled, insulated water bottles won’t collect condensation either, so that means the bottle won’t sweat or get wet, meaning its more manageable for your kid to maintain a grip of. It’s child safe and free of choking hazards, and the bright and fun bite valve has been designed so that it’s easy for an adult to remove but won’t pop off in little hands. From the Daily Hydration collection, it weighs 156 g and measures 9 x 7 x 20 cm. A range of fun and attractive designs are available to suit your kid’s character. With its fun and colorful graphics, Eddy Kids Vacuum Stainless Steel Bottle from CamelBak will certainly keep them happy as well as hydrated. With its spill-resistant design, it’s easy for kids to handle and will keep liquids colder for longer. The unique powder coated paint job adds to the aesthetic appeal and delivers an extra pop of vibrant fun color. The bite-valve makes it easy to drink from but difficult to spill. 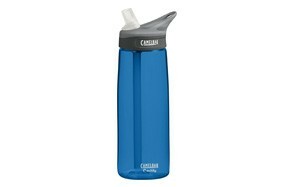 Again, it’s from CamelBak’s Daily Hydration collection, and it weighs 275 g and measures 7.5 x 7.5 x 19 cm. Be sure to combine it with some of the best smartwatches for kids and keep them equipped for any adventure.